The Geneva-based encrypted email service ProtonMail was forced to pay a Ransom of almost $6,000 to stop sustained Denial-of-service (DDoS) attacks that have knocked its service offline since Tuesday. ProtonMail – a full, end-to-end encrypted email service that launched last year – has been dealing with, what it called, the extremely powerful DDoS attack, and is still unavailable at the time of writing. In an official statement posted on a WordPress blog Thursday, officials of ProtonMail said the powerful DDoS attack by an unknown group of hackers forced them to pay 15 Bitcoins (about $5,850) in exchange for them halting the assault. 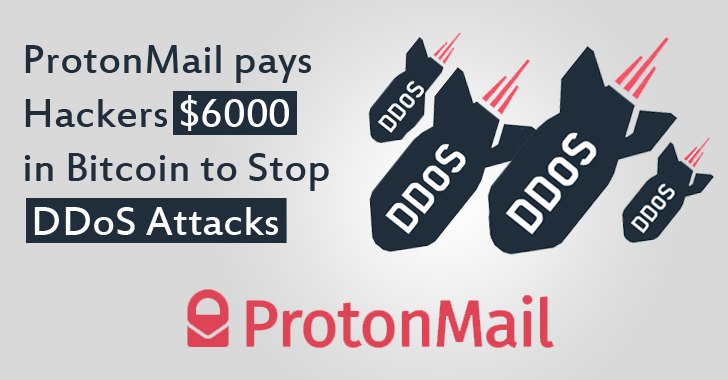 However, even after paying the ransom amount, the crippling DDoS attacks continued to the ProtonMail service. ProtonMail officials said, "We hoped that by paying [ransom], we could spare other companies impacted by the [DDoS] attack against us, but the attack continued nevertheless." "Attacks against [key] infrastructure continued throughout the evening and to keep other customers online, our ISP [Internet Service Provider] was forced to stop announcing our IP range, effectively taking us offline." However, the criminals who extorted ProtonMail previously did not take responsibility for the second DDoS attack, which according to the company, was more "scary" and "a full-scale infrastructure attack." "This coordinated assault on [our] key infrastructure eventually managed to bring down both the ISP and the datacenter, which impacted hundreds of other companies, not just ProtonMail," the company wrote. Although the motive behind the attack is still unclear, ProtonMail promises that it is working hard to restore the service to its users. The company is working with both the security officials in its Switzerland-based data center and others across the world to get the situation under control. In its official Twitter account, ProtonMail reassured its customers that their data is "secure and untouched," but access to its site is unlikely, before confirming on Thursday that the service was under second DDoS attack. ProtonMail offers an end-to-end encrypted webmail system designed by CERN scientists to fight snooping by law enforcement agencies like the NSA. Since its launch, the service has over 500,000 users worldwide.